Investors in clean energy are looking to Maine's gubernatorial election to see if the political opposition to wind power will shift in the state, which is currently leading in Northeast wind generation. A panel on Maine's wind prospects directly addressed the future political landscape, as part of the discussions at the American Wind Energy Association (AWEA) Northeast regional two-day conference at the end of June. "We’re in a position now where our negative business reputation precedes us," Payne said. His wind industry advocacy group filed a lawsuit against Gov. LePage for the executive moratorium. LePage had called the current law expediting wind energy development permitting as "too ambitious and overly permissive," placing new permitting under a moratorium and announcing other efforts to amend wind permitting laws. With LePage's term coming to an end, other clean air advocates and investors are watching for signals that the future governor will at least revoke LePage's executive order. Of the four gubernatorial candidates, the Portland Press-Herald reported that two strongly supported more wind development, while the others made distinctions about the extent of their support. Republican Candidate Shawn Moody told the Press-Herald he would require economic impact studies, based on the tourism and recreation industries. Moody's campaign did not answer requests for comment from Utility Dive. "It’s difficult to assess sort of what his position would be on wind, renewables, or energy investments generally," Payne said. He sees it as his job to connect with Moody's campaign and the other candidates to reach out about the investment opportunity in host communities and other benefits of onshore wind. "If they do seek to provide or require some sort of economic impact," Payne said he hopes that the next governor will "apply it across the board to every industry, that it’s not just targeted at wind." "Developers are keen to understand what will be the policy impact," Foley said. Maine's onshore wind power developments have been made with power purchase agreements regionally, as well as in-state. "Any kind of instate policy decision like that would have a significant impact regionally," Foley said of the moratorium. 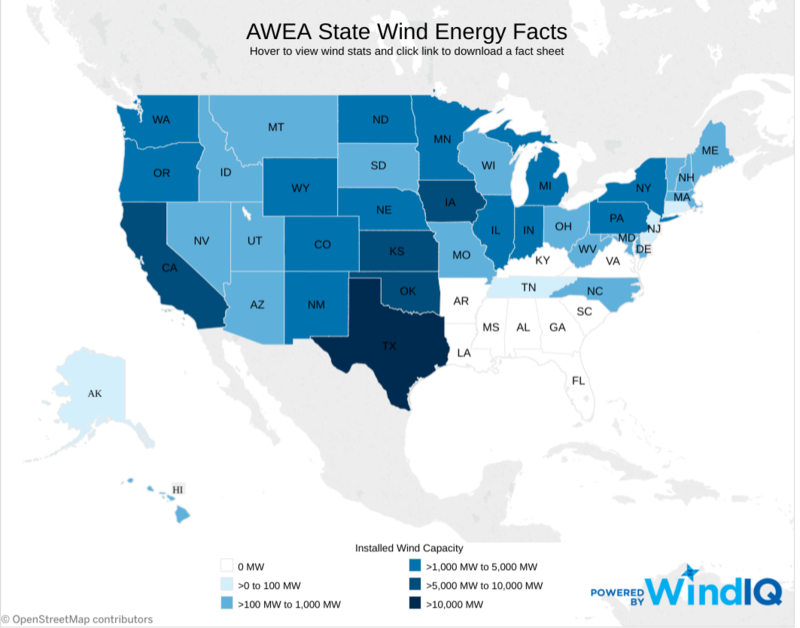 AWEA notes that Maine is a top onshore wind producer in the Northeast, but the state's efforts to lead in offshore have slowed with opposition from LePage's administration. Meanwhile other states like Massachusetts, Rhode Island and, most recently, Connecticut selected offshore wind developers to further state clean energy resource targets. While Northeast states' offshore wind procurement grows, Foley pointed out that onshore wind remains one of the the cheapest forms of electricity. Maine is currently ranked 22nd among states for installed wind capacity. Even a short moratorium could still have longer term impacts, "because it sends market signals" of unreliability and uncertainty, ACORE's Foley said. LePage is not the only governor to enact a moratorium on renewables, Foley said, referencing Ohio Republican Gov. John Kasich's 2014 two-year freeze of the state's renewable energy and efficiency standards. Kasich vetoed a bill that would have extended the freeze at the end of 2016. The two-year freeze was opposed by a handful of Ohio businesses in addition to clean energy advocate. "If we would like to see investments avoid Maine, moratoria and unfair and unreasonable treatment of the wind industry is the best way to do that," Payne said.